JUNE 25--Seeking to unload a Confederate flag? Perhaps you should look up Edward Lee West. 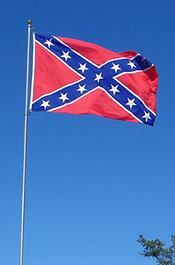 In the wake of the South Carolina church massacre, West has moved to further cover his North Carolina home in the rebel flag. The above photo shows the 69-year-old West’s Arrington Avenue home in his largely African-American neighborhood in Rocky Mount, a city about 60 miles east of Raleigh. The below photo shows West’s modest spread as it appeared when a Google Street View car drove by three years ago. West is seen at right in a mug shot taken following a 2010 arrest for assault with a deadly weapon (he eventually pleaded guilty to illegally discharging a weapon). His rap sheet includes numerous arrests, many involving gun counts. West is due in court next month on a probation violation charge stemming from his conviction earlier this year for “Assault Pointing Gun,” according to court and corrections department records. West was sentenced to two years probation in that misdemeanor case.